I have the same philosophy about quilting as I do chocolate: If some is good, more is better. My quilts and waistline attest to my commitment to this theory. 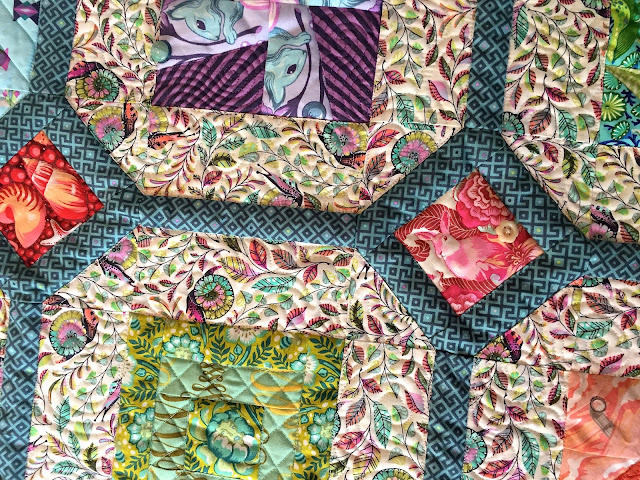 My version of the Bernina 125th Anniversary Quilt Along pattern illustrates my maximalist quilting style. 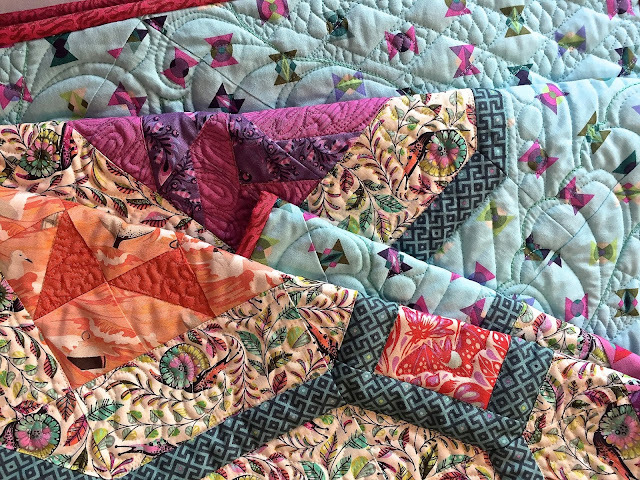 See the official quilt along post with quilting suggestions on the Bernina blog. The quilting was accomplished using hand-guided free-motion and ruler work on my domestic Bernina. 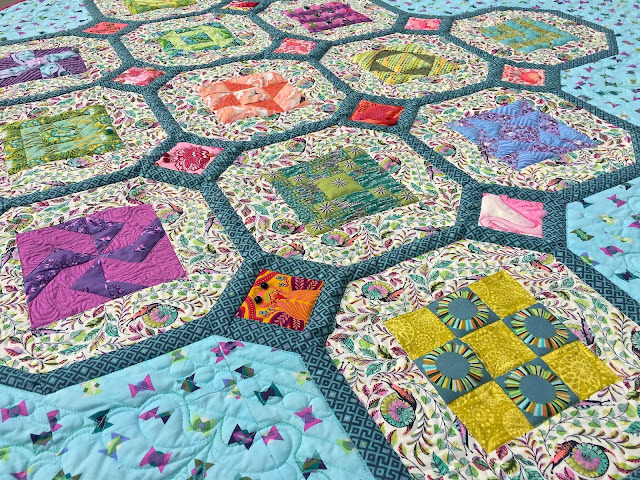 I took my cue from the fabrics when selecting free-motion and ruler work designs to highlight the piecing and prints. I contemplated which areas to quilt more densely, and which to emphasize with loftier texture. Using the Bernina walking foot, I outlined the outer edge of the framework, as it feeds the layers evenly and maintains a straight line. For the interior seams, I stabilized using a ruler foot and ruler on my domestic machine. I chose a bracket design filled with 1″ diagonal gridwork for the outer section. The bracket was topped with feathers, and then echoed. Alternate diamonds were filled with ribbon candy. I used Aurifil 12 weight thread to highlight the bracket and feather echo. 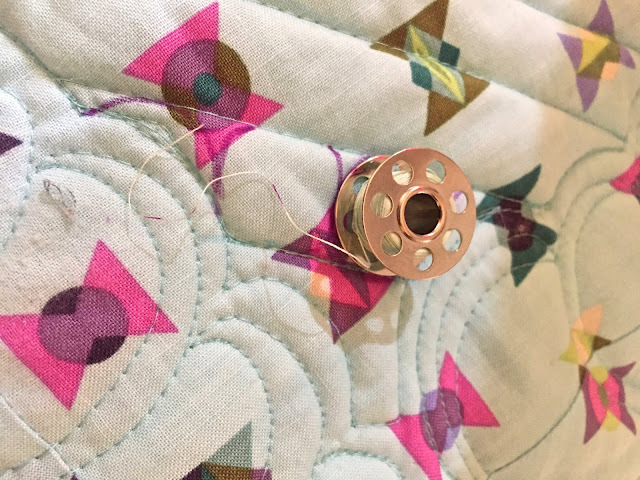 I recommend increasing the stitch length, using 50 weight in the bobbin in a hue that matches the backing fabric, taking a slow pace, hanging tight to the thread ends when starting a new section, and pulling just the thread ends into the batting rather than the knot when tying off. I marked 3/4″ vertical lines in the remaining space. Using a bobbin and air erasable marker, I marked pebbles in randomly selected columns. 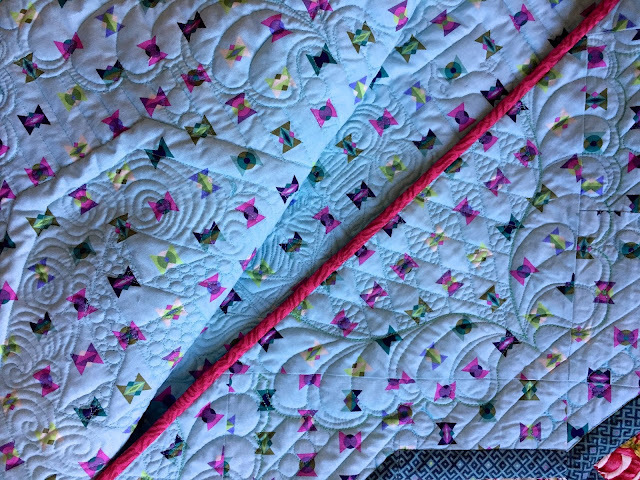 I quilted these by going over the top half of one circle and then the bottom of another, repeating this sequence while forming a serpentine line, until I came to the end of the column. Then I completed the other half of the pebbles in the second pass. This allowed me to travel in the ditch of the framework from one column to the next without knotting and burying my thread. I filled the interior background with S-curves, echoing curves, and swirls to compliment the snails. The cornerstones were quilted by outlining the fabric designs. As I like to highlight the texture of the quilting, I matching 50 wt Aurifil thread colors to the fabrics. 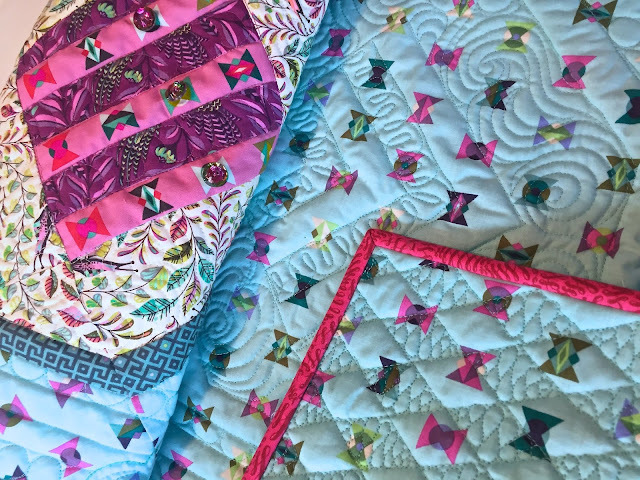 It proved very helpful to have a plentiful assortment, given the ample amount of colors in the Tula Pink fabrics. I used every single spool shown below! Oh my, your quilt is stunning! Absolutely beautiful!